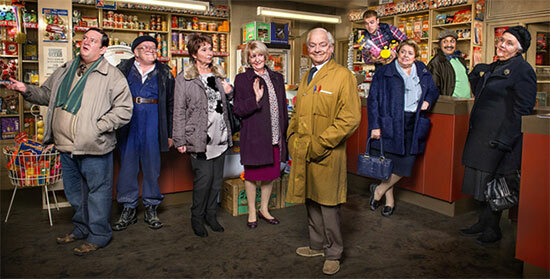 Still Open All Hours and more programming news! I’ve got some great news for fans of Are You Being Served?! The staff of Grace Brothers Department Store will be returning to Afternoon Tea starting at 3:30pm Monday, November 13th! It’ll be followed at 4pm by another comedy series you won’t want to miss – the Open All Hours sequel, aptly called Still Open All Hours. Four years ago, after the doors of Arkwrights Shop had been closed for almost 30 years, the BBC aired a one off Christmas Special that had Granville, played by actor David Jason, taking over the shop, after inheriting it from his uncle, Albert Arkwright. Sadly Ronnie Barker, who played the stuttering, tight fisted Arkwright, died of heart failure in 2005 at the age of 77. Despite the much loved actor’s absence, however, the spin-off was such a big hit with viewers that the BBC decided to resurrect the series permanently. As well as Granville, also appearing in Still Open All Hours are Nurse Gladys Emmanuel, played by Linda Barron, Mrs. Delphine Featherstone, played by actress Stephanie Cole and Mavis, played by Margaret Ollerenshaw. 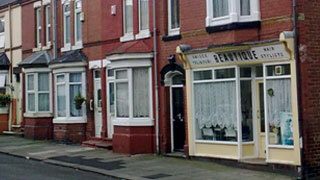 It is also still filmed in the same location as the original series – Doncaster in South Yorkshire. Unfortunately, security on the street where filming takes place has had to be beefed up lately, after what is reported to have been a "credible" threat was made on David Jason’s life. While full details of the threat have not been disclosed, the show’s security team are “taking no chances”. As well as putting up cordons to the street on which filming takes place, they have hired security guards to protect the 77-year-old actor. Jason, who was knighted in 2005 and who recently celebrated his 50th year in television, is the U.K.'s most popular comic actor. He’s also of course known to MPT viewers not only as Granville, but as Detective Inspector Jack Frost in A Touch of Frost. 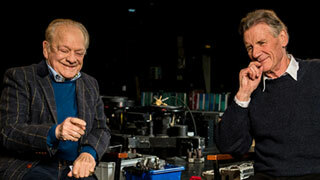 Now it appears as though Sir David has a real life mystery on his hands, which will hopefully be resolved very soon. We wish the actor well and will be sure to update you on any developments concerning the threat.